Tallinn Airport, self proclaimed as the world’s coziest airport, just got a little cozier with the introduction of new sleep pods! The airport is the fifth to bring the Finnish GoSleep Sleep Pods to its terminals, and is currently the only airport to offer them free of charge to tired travelers! Tallinn has 5 pods in total: 4 are located at Gates 8 and 9, and the fifth is found in the business lounge. Each one begins as a chair, but transforms into a bed/cocoon as you recline and pull a curtain down over the front. Hand luggage can be stowed safely under the seat, and devices can be charged inside the pod. Not really tired? You might also consider borrowing a book from the airport library to curl up within your cradle. Passengers with return tickets to Tallinn are permitted to take the book with them on vacation, returning it when they fly back through. Cozy, right? 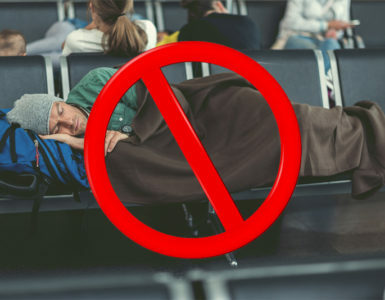 It is worth noting that while Tallinn does technically close at night, travelers have been permitted to sleep in the public area if they have proof of onward travel the next morning. Otherwise, once you pass through security, these sleep pods will likely be a cheap spot for a quick recline before boarding your flight! Tell us what you think about these new sleep pods in the comment section below! Top 6 Airports Offering Free Layover Tours! how do they keep them clean? I like the idea of putting sleep pods at airports. I think other airports should have these also. For everyone’s convenience!